This recipe comes from a Time Life-Books series - "Foods of the World" - published in 1968. I think my mother had (or maybe still has) all of them. They came two books per part of the world - one large hardbound book that had a lot of historical and cultural information and recipes, and then the smaller wire ring-bound volume that just had the recipes. Bill's mother had the two volumes for Chinese Cooking, and now we have them on our shelf. Bill had picked up a can of fresh crabmeat when he was shopping for the Soft Shell Crab Roll and other things we made a couple weekends ago. The grocery store he was in didn't have soft shell crabs, so he figured any crabmeat would do. Then I mentioned where we could get frozen soft shell crabs (at Dave's Marketplace - their East Greenwich location is the one I use most) and so we didn't end up using the crabmeat for the rolls. So. 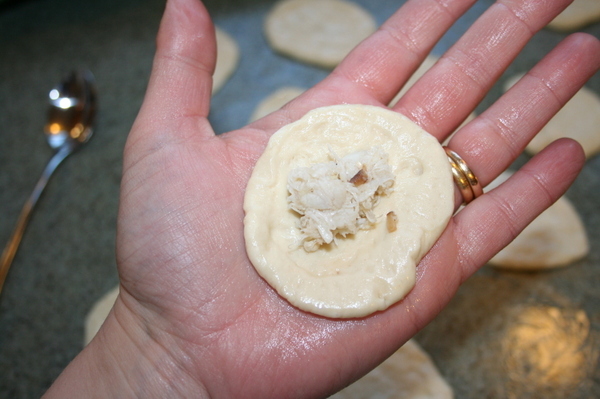 Bill thought we could make these dumplings with the crabmeat at some point. It took a while to get done - there's a bit of a time committment, and for one reason and another, it didn't get done. At last, I made them Friday night. Actually, I started things on Thursday - I was going to include them as part of our dinner - but I didn't have time to put them together, so into the fridge went the filling and the dough. Oh - and another thing - I changed the recipe. Or, rather, I used a different dough than the one called for, mainly because I didn't have tapioca flour. So I found another dough recipe - a yeasted bread dough, actually, that was used in other recipes (same book) for other steamed dumplings. So you're getting my rendition of the recipe, actually, and not the exact on in the book. Is that enough of a back story? Here's the recipe. 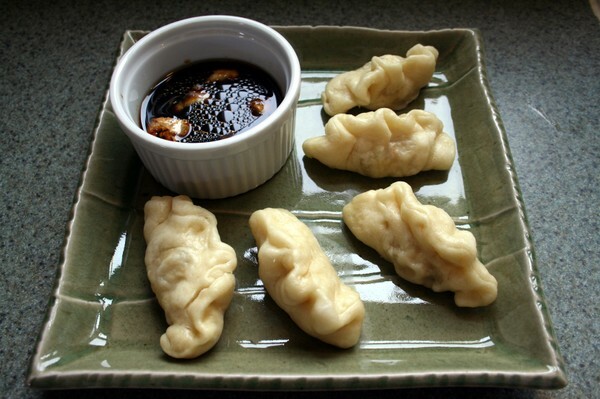 You'll have approximately 4 dozen dumplings, and because I used a different dough recipe, you will have some left over. Freeze it, or get creative. 1 pkg dry active yeast - I had a jar on hand - a package is about a tablespoon. 4 cups all purpose flour. Very simple - sprinkle the yeast and the sugar in the 1/4 cup of water and blend. Set aside to allow the yeast to become active. Then combine with the milk, and add the flour. If you're doing it by hand, add the flour a cup or so at a time, stirring well to incorporate. Once the dough is too stiff and sticky to stir, pour it out onto a board and knead in the rest of the flour. Continue to knead until you've got a nice, firm ball of dough. Place the dough in a very lightly greased bowl and cover with a damp towel. Set in a warm place and allow to double in bulk - about 1-2 hours, depending on the environment. 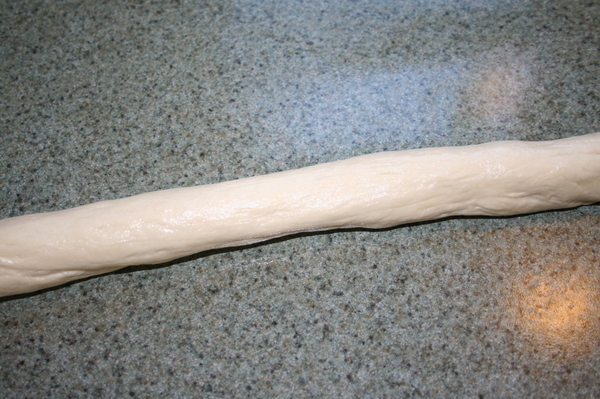 Punch the dough down, and allow to rise again for 20-30 minutes. 2 dried chinese mushrooms, an inch to an inch and a half in diameter. 1. In a small bowl, cover the mushrooms with some warm water and let them soak for 30 minutes to rehydrate. (It helps to place another bowl or something on top of the mushrooms, to help keep them submerged at first.) Then, remove the mushrooms, discard the water, and remove the stems. Chop up the caps as fine as possible. Set aside. 2. 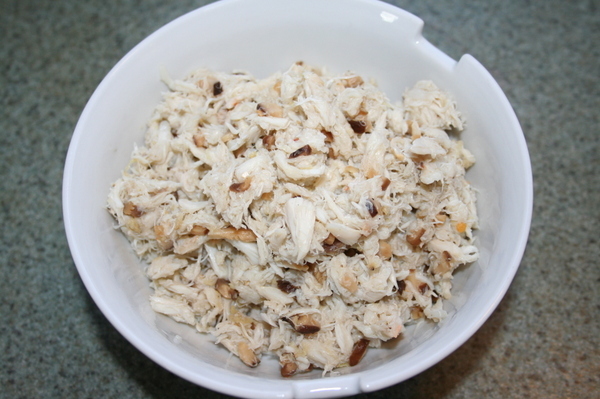 Pick through the crabmeat to remove any bits of shell or cartilage. Shred it and set aside. 3. Place the oil, ginger, salt, pepper and sugar within easy reach. 4. Set a wok or skillet over high heat for about 30 seconds. Pour in the oil, swirl it about and heat for another 30 seconds, reducing the heat to moderate if the oil begins to smoke. Add the ginger, then the mushrooms and crabmeat and stir-fry for 2-3 minutes. Then stir in the salt, pepper and sugar, stirring for 30 seconds longer, and transfer the entire contents of the pan to a bowl. Cool to room temperature. 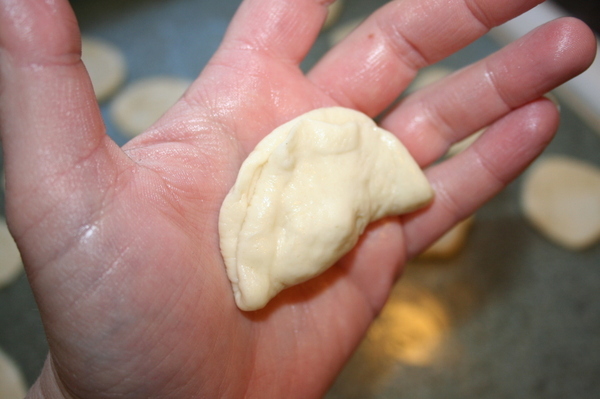 Cut the dough into quarters. Cover three sections while you work with the first one. 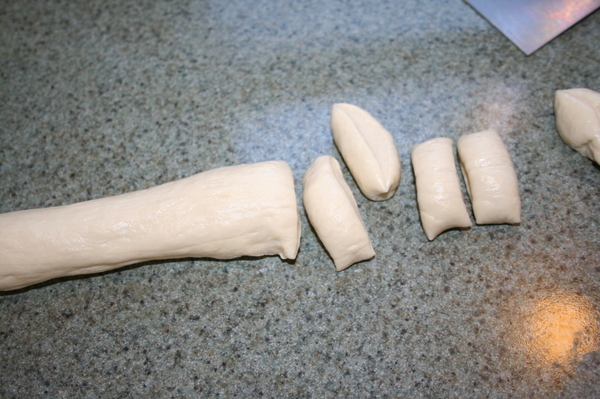 Lightly oil your work surface and roll the first piece of dough into a log about an inch in diameter. Next, take a knife or bench scraper and cut the log into pieces half an inch or so wide. Next, the directions say to "lightly oil one side of the cleaver blade and, with the palm of your hand, firmly press the blade down on each slice of dough, flattening it into a 2 1/2 inch round." So I did that. 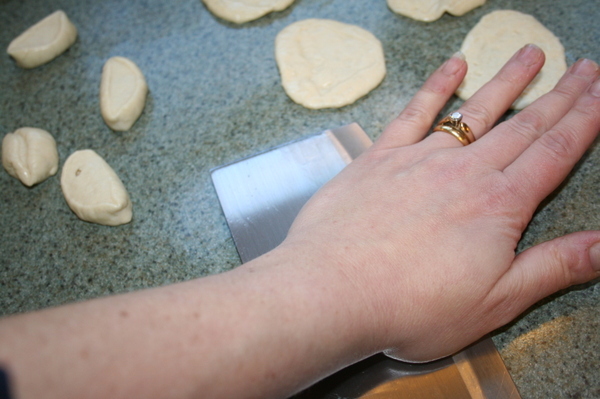 Anyway, that worked, but it was just as easy to flatten the dough with my fingers, and faster. Whatever method you choose, after you get them all flattened, take one in the palm of your hand and place a teaspoon of the filling in the center. And as you're sealing the edges, you want to sort of pleat the seam edge by making little folds as you go along. 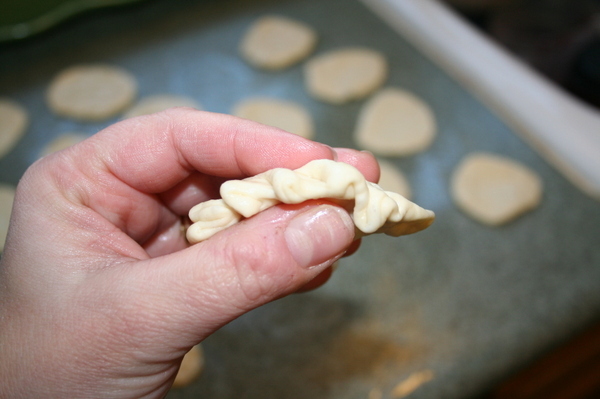 This particular dough seemed rather soft and floppy while I was doing it, so the pleats weren't very sharp. And I'm also not a professional. The main thing is, seal them up so nothing pops out while they're cooking. After you've pleated the edge, set the dumpling down on a lightly oiled platter or plate while you make the rest of them. Press the dumpling down a bit so it's "sitting" with the pleated edge up. If you've got a bamboo steamer, you want to get a shallow pan wider than the steamer and pour in enough boiling water to come up about an inch on the side of the steamer. (Sorry - I didn't take pictures at this point.) 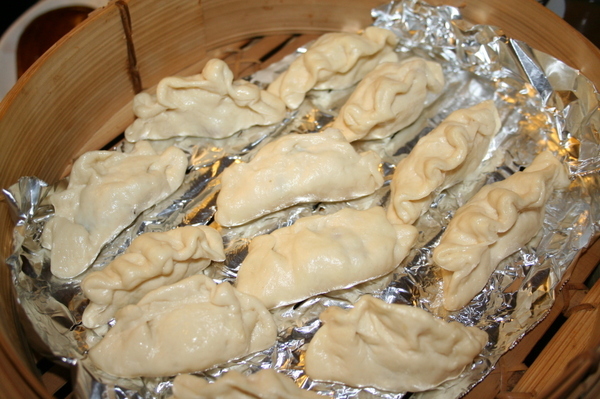 Place the dumplings in the racks of the steamer - not too close together, as they expand somewhat while they cook. Set the entire bamboo steamer and lid on the water in the pan and let steam (water still boiling) for 5 minutes. Keep a kettle of boiling water handy, in case you need more during the cooking process. We have two steamers, with two racks each, and that worked perfectly for the 46 dumplings I made. You can keep the first batch warm by just keeping the lid on the steamer while you cook the other batch. Bill made a little dipping sauce for them, too. He used soy sauce, sesame oil, fresh ginger and garlic, and rice vinegar, and maybe some sugar.